Largely, they are sensible souls, yet they pay the equivalent of a car instalment or more every month to store possessions they mostly don’t use. They’ve not solved their clutter problem. They’ve merely hauled it away to where they can’t see it, into a shadow world of breeze block huts and sheet metal lit by garish security bulbs. It still haunts them, though. Some confide that when they visit their units they feel overwhelmed by the mountainous piles of belongings. As the saying goes: “It’s easy as heck to get into a storage unit, but hard as hell to get out of one”. Some continue to accumulate even after they have moved piles into a unit, so they rent another. And all the while often knowing that what’s inside is worth less than storage costs. No matter how broke they are, people are so wedded to their belongings that default on rental payments is rare. Self-storage is a service Americans didn’t need until they discovered it. Now it’s something many can’t live without. One in ten households have a unit. I reckon one reason the self storage industry took off so early, and strongly, is that many people believe, or did until recently, in the American dream. They aren’t storing possessions, they’re storing hopes of days when they will have a bigger, better home. Being a nation of immigrants also may have made them vulnerable to the storage habit. If you landed with few possessions, maybe you get more attached to the ones you acquire and then pass that trait down the generations? And, this being the ultimate consumer society, people have lots of stuff. But alongside rampant materialism runs a puritanical “’waste not, want not’ attitude, and a frontier mentality. People prepare for the worst, from natural disasters (and there are lots) to wars. That broken plastic thingymajig might come in handy if the big one hits, or the red button is pressed. Americans also like selling their homes like to ‘stage’ them – rearranging furniture and redecorating. As part of this they put clutter in storage, then forget what’s there. And Americans do lots of moving; the average American moves home 11 times. Just thinking about all that jumble gives me the heebie-jeebies. I ruthlessly follow the rule that if something is not useful, beautiful or deeply sentimental, chuck it. Maybe that last category is another clue to why people don’t let go of possessions? Many Americans often strike me as deeply sentimental. I understand that storage is a solution to short-term logistical problems. If you’re between homes, have serious hopes of moving to a bigger one or renovating, it can be better than relying on the goodwill of friends and relatives to keep your belongings. And storage is fine for serious collections and businesses. But using it to house possessions that, literally, don’t fit in your home is madness. Getting rid of stuff can be hard for everyone, not just pack rats and hoarders, but storage has given people an easy way out. Storage units, easily erected in a nation where land is relatively cheap, started springing up in the late 60s to help people cope with life events such as moving, death, and divorce. By the 90s, demand was outstripping supply as divorce rates had peaked and baby boomers were inheriting their parents’ possessions and buying newer homes without attics. There was a rush of new developments from major companies and entrepreneurs. A few even offered posh ‘homes’ for possessions with landscaping and waterfalls. Sometimes, there are valuables, as illustrated by the television show Storage Wars, in which professional buyers scour auctioned units when people have fallen behind on the rent. Sometimes what’s inside tells a story, as when Paris Hilton forgot to pay her rent and the auction revealed juicy contents. Occasionally you hear about drug trafficking money. 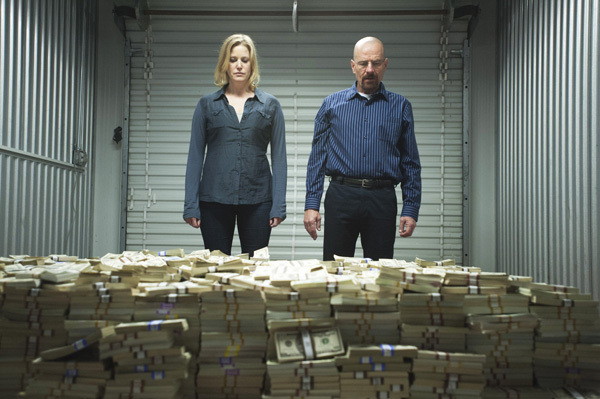 The mound of cash that Breaking Bad’s Skyler stored covered with a sheet and sprayed with insecticide to keep the silver fish away is art imitating life. Body parts of murder victims turn up. Then there’s the guy from South Carolina who went to court to reclaim his amputated leg, found when his unit’s contents were auctioned. He wanted to be buried with it. Units can be a base for a double life, like the sad story in the New York Times Magazine of the man who visited his every morning, and walked out dressed as a woman. Demand for storage remains strong in bad times, as well as good. Lately, more people have been storing, not because they are outgrowing their home but because they can no longer afford one. These include adults moving back in with parents, downsizers, and desperate people living in trailers and cars. And more people are dying with stuff in storage, leaving behind legal wrangles about ownership. Didn’t they know you can’t take it with you? That there are no pockets in a shroud, or furniture vans behind a hearse? Brits reading this shouldn’t feel smug. The self-storage industry in Britain didn’t really exist 30 years ago, but now it’s the biggest in Europe and thriving in places like London, Leeds and Manchester.